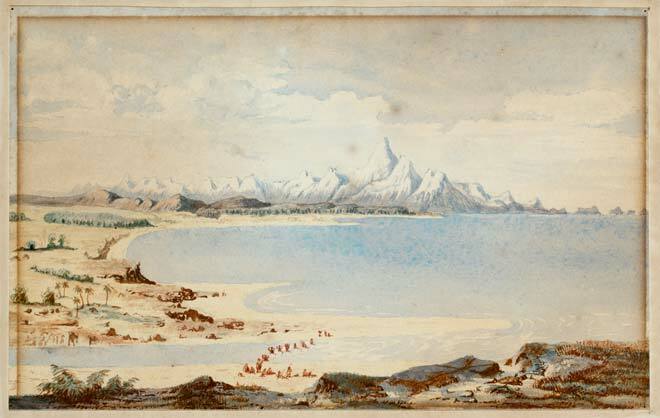 Charles Heaphy sketched this scene of the Arahura on the West Coast about 1846, well before gold was discovered in New Zealand. Subsequently, an unknown watercolourist copied the scene to produce this painting. The explorers Heaphy and Thomas Brunner used Māori guides, but their journals make no reference to gold. Another explorer, James Mackay, visited in 1857, but on the topic of gold thought the West Coast ‘as destitute of that article as the Nelson provincial treasury’. But he was wrong, as the gold discoveries of the 1860s would prove.